You shall not make for yourself a carved image, or any likeness of anything that is in heaven above, or that is in the earth beneath, or that is in the water under the earth. You shall not bow down to them or serve them, for I the LORD your God am a jealous God. Eucharistic adoration is a sign of devotion to and worship of Jesus Christ, who is believed to be present in the consecrated host. The consecrated host is the physical presence of Christ in the sanctified bread and wine which Roman Catholics, and Anglo-Catholics, believe to be the actual body and blood of Jesus Christ. The consecrated host is placed in a monstrance and stationed on the altar for viewing at regular times during the week. The devotional and worship practice of adoring and praying to the consecrated host is practiced in local parishes, shrines, and monasteries. The belief that Christ is physically the wafer as displayed in the monstrance and is present in the midst of the congregation is a theological extension of the doctrine of transubstantiation. With some exceptions, those Roman Catholic, and Anglo-Catholic, churches who endorse Eucharistic adoration accept as true the doctrine of transubstantiation. The doctrine of transubstantiation is the belief of the Roman Catholic Church that the outward (accidents) appearance of the bread stays the same after consecration, but the host’s inner nature (substance) is changed into the body, blood, soul, and divinity of Christ. These categories of accidents and substance are the thought of Aristotle not the theological workings of the ancient fathers of the Church or the biblical teaching of Jesus Christ and Paul the Apostle. Eucharistic adoration is not an ancient practice; it began in Avignon, France on September 11, 1226. Public adoration of the Blessed Sacrament began as a thanksgiving celebration for the victory of France and the Roman Catholic Church over the Albigensians in the later battles of the Albigensian Crusade. King Louis VII desired that the sacrament be placed on display at the Chapel of the Holy Cross. The multitude of adorers brought the local diocesan bishop, Pierre de Corbie, to suggest that the display continue indefinitely. With the permission of Pope Honorius III, the idea was approved and adoration continued mostly uninterrupted until the French Revolution. Eucharistic adoration is not encouraged in the Orthodox churches of the East neither has this form of worship been practiced everywhere for all the time by all churches. For a practice or doctrine to be considered orthodox: it must have been received by the undivided Church (East and West), stood the test of time, and agreed upon by the consensus of the early fathers. This triple test of ecumenicity, antiquity, and consent is called the Vincentian canon and it is the overarching test for genuine Catholicity. In my view, the practice of Eucharistic devotion, that is displaying a monstrance containing a consecrated host for worship and prayer, does not pass the test of the Vincentian canon. Therefore, Eucharistic devotion does not meet the criterion as an acceptable practice within the Great Tradition and is not to be considered a theological conviction of the ancient faith. Russian Orthodox theologian, Alexander Schmemann, states that Eastern Orthodoxy does not practice the elevation of the bread and wine for special adoration. The Purpose of the Eucharist lies not in the change of the bread and wine, but in the partaking of Christ, who has become our food, our life, the manifestation of the Church as the body of Christ. This is why the gifts themselves never became in the Orthodox East an object of special reverence, contemplation, and adoration, and likewise an object of special theological “problematics”: how, when, in what manner their change is accomplished. Eastern Orthodoxy’s Eucharistic focus is not on the change in the elements, but on the presence of Christ, the power of the Holy Spirit, and the mystery of faith encountered in the ancient liturgy. Eastern Christians do not adore the consecrated bread outside the sacred liturgy. As would be expected, the Evangelical Reformers of the sixteenth century had grave doubts about the practice of Eucharistic adoration. They decried its use, discouraged participation, and condemned its practice within Roman Catholic Church. John Calvin and Ulrich Zwingli and their colleagues in Geneva and Zurich, respectively, issued a statement as to their common agreement concerning the nature of the Lord’s Supper. The document, Heads of Agreement on the Lord’s Supper, was written after the failure of the Marburg Colloquy. The Marburg Colloquy was an attempt to achieve a concord between Martin Luther and Zwingli over the nature of the Eucharist. Luther believed in real presence of Christ and Zwingli declared the elements of bread and wine to be merely symbolic. Luther and Zwingli’s disagreement was volatile and very public. Their discord was rending the Protestant movement at its very heart. The English Reformers agreed with Calvin and Zwingli writing in the Thirty-Nine Articles of Faith, “The sacraments were not instituted by Christ to be gazed at or carried about, but to be used properly” (Article XXV, updated language). With a few exceptions, Evangelicals continue to reject the use of a monstrance, they feel that confining God to an object is a form of idolatry. Many Roman Catholic, and Anglo-Catholics, are sincere in their desire to dwell in Christ’s presence, but it takes very little effort on the part of the Enemy to turn a sincere devotional activity into idolatry. Roman Catholics describe the consecrated host as “the physical body of Jesus,” thus the presence of the host in the monstrance is said to increase the anointing of the Holy Spirit in the sanctuary. It is said, if the monstrance is removed, God’s presence is removed. If “the host and precious blood” are returned to the sanctuary, Christ’s presence has returned. To state that God’s presence is contained or limited within a physical object is a form of idolatry (Exodus 20:4-6). Idolatry reduces God the Creator to a material object of creation thereby limiting his attributes of omniscience, omnipotence, and omnipresence. The Lord is no longer Spirit, but an object which can be controlled by human beings (Isa. 40:18-23). It grieves me as a believer, pastor, and theologian, that God’s precious gift to us of Holy Communion has been twisted and made into an object. I have no doubt that that the adorers are sincere in their desire to be in the presence of Christ. However, it will not take long for the flesh, or the Enemy, to bring misunderstanding about the nature of salvation causing much personal sorrow and emotional pain to all involved. Arguments that Eucharistic adoration is a blessing to parishioners by increasing the presence of God in the church building is experiential and subjective without basis in scripture or tradition. Instead of the Table of the Lord being a place of participation in Christ, it becomes a night stand for observing God from a distance. Adoration confuses the physical object with its Author, and the location of God with a material entity, and limits God’s attributes to a place and time. Alexander Schmemann’s main criticism of Eucharistic adoration is that the practice isolates the Eucharist from its purpose: communion with God (pg. 227). The Eucharist is removed from its context in the liturgy as the communion of the Church with Christ and places Christ at a distance, objectifying the Eucharist in a manner not consistent with the whole meaning of the Lord’s Supper. Holy Eucharist is intended to be place of an encounter with the living resurrected Christ. In Scripture, seven theological images or truths of the Eucharist are revealed: remembrance, communion, forgiveness, covenant, nourishment, anticipation, and thanksgiving. These truths cannot be experienced if we are watching instead of participating. Eucharistic adoration as a belief and practice is erroneous: it does not reflect the teaching of the Bible or life of worship found in the Ancient Church. The practice is not promoted in the Orthodox East and is not consistent with full and complete participation in the Holy Eucharist. Caveat: The views expressed in this blog post are entirely my own and are not necessarily the views of the Diocese of the Central Gulf Coast, Southeast Archdiocese, or the International Communion of the Charismatic Episcopal Church (C.E.C.). This entry was posted in Holy Eucharist, Roman Catholic Church and tagged Eucharistic Adoration, Monstrance, Roman Catholic on September 25, 2012 by GlennDavis. You have no idea the lies and error the devil has people believing. The one thing the devil does best is twist scripture and give a 1/2 truth and that is where he has confused many. The body and blood of Jesus is transformed during consecration of the bread and wine at Mass by the Holy Spirit. The Host for adoration is consecrated at this time also. In Lanciano Italy there was a priest like yourself not believing it to be really Jesus but Jesus showed him truth, the host bled and they had it diagnosed by doctors without telling them what it was and the diagnosis came back as it being a part of a human heart, I suggest you read about that miracle and others like it for doubting Thomas’ which by the way the devil does doubt darts and this is one to divide the Church but Jesus provided proof to reunite the Church but alas people have stubborn minds and hardened hearts. Jesus did not say at the last supper this is a symbol of my body and blood, Jesus said this is my body and this is my blood at the last supper to tell the apostle He can be in any object and be an object. Jesus is light, is that not an object? I have seen Him as a gold lightning bolt which is light. I have seen Him in the clouds and God also, courtesy of the Holy Spirit, is that not an object? He is present in the host because He is the host and its His wedding feast, His banquet, His food that He has placed this table for us in front of our enemies. He nourishes us with Himself everyday to help us do battle with Him, not alone. The blood of Jesus does not taste the same at every Mass and the priest uses the same wine. Jesus lets us know how sweet He is and that it is truth about being Him as told about the wedding at Cana where He transformed water into wine and it was the best. His first miracle in the Bible continues. The body dissolves and it too can be sweeter some days, this is how Jesus rewards us who believe what He says and don’t doubt Him. The Church Fathers did the consecration at every Mass. Do you know the story of St. Clare of Assissi. St. Francis of Assissi had the stigmata and is a Franciscan priest who Jesus asked to rebuild His Church. Francis did rebuild it and still is, St. Clare wanted to be like Francis and started the order the Poor Clares. they were born in 1181 and 1191 respectively. St. Clare took the monstrance which is the gold holder of Jesus and took it around the monastery like Joshua did around Jericho when they were being attacked and she asked for the Lord’s protection and the attackers fled. This is not idol worship this is belief in what Jesus says. Also with her to do this which happened before the time with France sstatedin 1226, adoration was happening long before then so that information too is incorrect. The devil with his lies will also use wrong dates. It is Jesus but like I said the devil throws fear and doubt for dissension. The Church got divided because of people relying on their own or the devils understanding and not God’s. When you do not include God in your discussion about Him error happens. The error here is disbelief, relying on your own understanding which God said not to do, and misinterpretation of the Bible. When reading the Bible with the Holy Spirit ask Him to help you interpret it correctly. Usually meditating also called contemplation on a verse or story of the Bible the Holy Spirit will tell you truth. 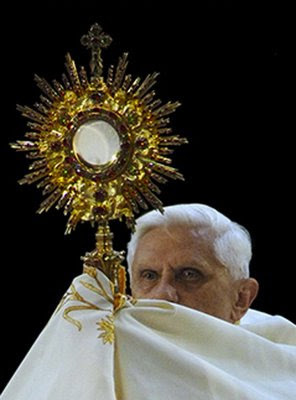 Sitting in front of the monstrance adoring Jesus is not idol worship. We are talking to Jesus and He speaks to us, there are many stories about Jesus asking us to do this. He does not like being not loved and neither does God and taking time out of our day to spend alone shows proof we love Him. Catalina had experiences where Jesus told her what He wants to happen with adoration and the Mass and what happens. Look her up she lived in South America and there is a movie with truth called The Greatest Miracle about the Mass, watch it because she was shown this by the Holy Ones. The Holy Spirit will also tell you truth of experiences that occur that are not in the Bible, just ask instead of believing lies. Everyone has experiences and they aren’t written in the Bible which the lie the devil spread is Bible alone. God, Jesus, the Holy Spirit and all those in heaven are not dead but are still working, they pray for us every day just because they are in heaven does not mean they quit working. Jesus is trying to unite the Church and bring back all the lost sheep but when people are not getting truth they are not helping. We do not do idol worship we do not worship statues. We have them as reminders of who they are, what they have experienced on earth in their battles and to remind us to ask them to pray with us and for us, they are intercessors and see God face to face and having someone in the Church triumphant wanting what we want helps our petitions be answered favorably. It is like having a picture of your mother, do you consider that idol worship. Get the facts before doing what the devil does best using people to falsely accuse them which causes them to sin and break the commandment though shall not bear false witness. Instead of looking in the Catholic Church come in and get the truth. Tell me why were Catholics martyred in the Roman Coliseum and not others? Tell me why is the Catholic Church the most persecuted? Tell me why do Catholics receive the apparitions of the Holy Ones and protestants do not unless it is the truth and the devil does not want people doing as Jesus said and obeying Jesus with receiving the body and blood consecrated by a priest because the devil knows the power of that and adoration and the graces we receve from them Did you know their is a virginity crown and martyrdom crown? Read the book Divine Love and find out what Jesus did with Sister Josefa it is eye opening. Practice what Paul says with what love is in Corinthians and forgiveness you can learn how to not hold grudges and forgive at Celebrate Recovery. Do not be dragged into the devils lies and web of deceit find out truth ask Jesus He will tell you He is the truth and the only ones we worship are The Holy Trinity. God Bless and I will pray for non believers of truth because it makes them against Jesus and what He teaches aka anti Christ. Appreciate the feedback, but prove your views of the Eucharist through Scripture. It’s in the Gospel according to Mark 14:22-25. Though I don’t believe staring at consecrated bread and wine as a means of worship, your better argument for adoration would be John 6:53-58.